Advertising and Promotion: An Integrated Marketing Communications Perspective 8 Edition Belch/Belch 8th edition continues its Advertising focus with an emphasis on IMC. It includes very comprehensive coverage of Agency issues and creative work and how it is related to the IMC mix. 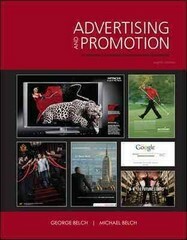 The authors understand that marketers must look beyond traditional media in order to achieve success. In order to best communicate with consumers, advertisers must utilize a myriad of tools (advertising, public relations, direct marketing, interactive/Internet marketing, sales promotion, and personal selling); Belch/Belch is the first book to reflect the shift from the conventional methods of advertising to the more widely recognized approach of implementing an integrated marketing communications strategy. The text underscores the importance of recognizing that a firm must use all promotional tools available to convey a unified message to the consumer. The integrated marketing communications perspective (the theme of the text) catapults the reader into the business practices of the 21st century.